Low voltage detection and recording. i.e. if your power feed is bad or you have noise on your lines dragging the CPU low, but not low enough to reset, you will see it in the logs. After actually sleeping, I noticed this while commenting other stuff out to eliminate it. Of course, I quickly uncommented everything and this, and we are back closer to where we were, but still not all the way. When wheel inputs now function again, but fuel and ignition are still missing for some reason. Hopefully I'll iron that out some time today. I just proved that my pointers are pointing in random directions (and had breakfast). Hmmm, grep -rn PORTA . doesn't show me writing to it... yet its flashing proportionally to RPM... hmmmm. After trying all sorts of stuff to get it to behave, I moved the init of the array of pointers to the init.c file instead of global.c so that it was something run rather than something existing before runtime, and it works mostly. It's a bit funny though, so more debug/understanding required. Well, it was definitely hardware! Interesting. Caps on the RPM inputs are a BAD thing apparently. Not only do they combined with the input resistor severely limit RPM, they also severely shorten the pulses, but worse, they do it in an rpm dependent way. I snipped the returns on the two H1 input caps and put bigger caps straight onto the adapt card. that made it worse, not better, so i put smaller ones in, better, took them out, perfect. strange. I'll repeat this info in the hardware thread so other testers don't make the same mistakes. This arvos release will be a good one hopefully, even if it doesn't have ignition working just yet. Removed 6x duplication in injection_isrs.c by splitting to injector_isr.c and using defines and imports. Added LVI interrupt logging to record low voltage conditions. Heavily revised all fuel code to use arrays instead of defines. I should release a bug fix for the 0.0.9, but because no one is using it just yet, I'll just tell you that I have fixed it and it will be right in the next release. If anyone needs the code for whatever, let me know. 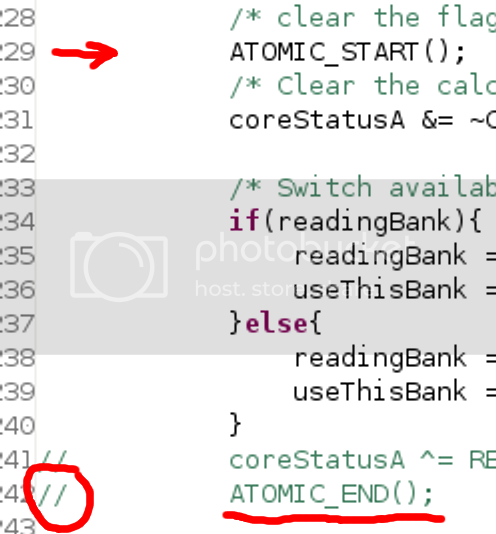 I decided to try to verify the fix, and wrote the lost sync counter out to an IO port. Within a few seconds of operation I had a "lost sync". That could easily have caused the issues I was seeing. I'll changed that bugs status to fixed and get on with making ignition and injection timing a reality. My initial simple attempt to fix injection timing failed. So, I need to try to understand what is going on there and resolve that. It needs prediction so that it can come closer to the maximum amount during dynamic situations, but, currently limiting to half of an engine cycle or 0xFFFF (whichever is smaller) works pretty well.